I love looking at paper illustrations and crafting. There's that tactile feel that digital illustrations can never replicate. And then there's the surprise you get when you see how artists use paper in a way you do not expect. There are plenty of beautiful visual surprises in this book. Paper Cut is authored by Owen Gildersleeve who's a designer, set maker and papercraft illustrator. The book starts with a brief introduction to paper cutting before going to featuring the artists and their works. The focus is on the 25 papercraft artists that are featured. Each artist has a Q&A interview that talks about the type of work they do, their projects, inspiration, challenges, tools of trade (the type of paper), their process and even tips for beginners looking to enter this creative field. It's a good insight into their thought process, and how they manage their projects, especially on making sure the art direction matches what their clients have in mind. The examples are absolutely beautiful and eye catching. Many use paper as the main showcase to create the artwork while others use paper as ornaments. You can see paper being used to create collages, miniature models, dresses, stage sets, book illustrations and more. It's a joy to look at all the creative uses of paper. Even the colour schemes picked are very well done. With paper, much of what is created is cut. The meticulous execution from idea to final result is impressive, sometimes awe-inspiring. Take for example the portrait drawings of Yulia Brodskya where each piece of paper is used to represent each wrinkle. Or Rob Ryan's illustrations which are drawn by cutting shapes out of a piece of paper. It's clear that a lot of time and effort are spent to create these artworks. It's admirable how these artists are so dedicated to their work. It's also quite fascinating to discover the different purposes that these artist use paper for, such as creating something that's wearable, or to complement another product, or to market a particular product. 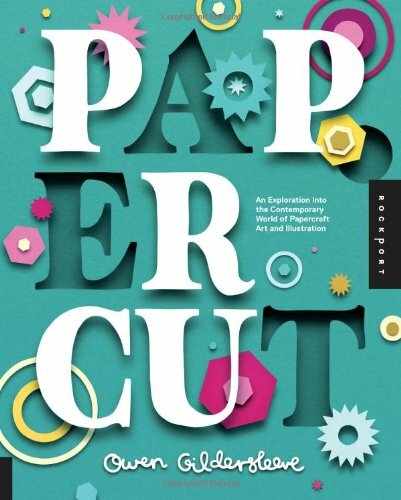 This is a inspiring and beautiful book for those into paper art and crafting.